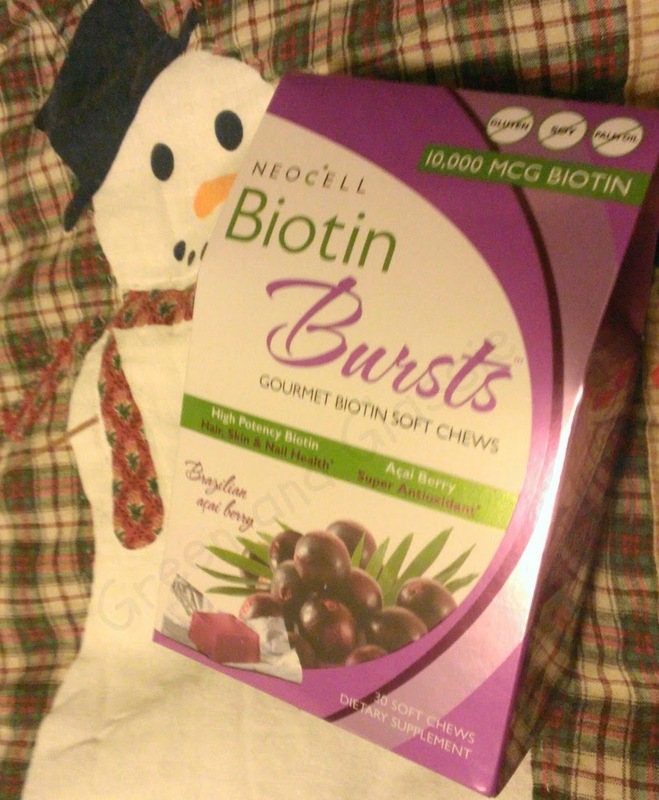 I was given the opportunity to review NeoCell's Biotin Bursts . Biotin Bursts are chewable goodness loaded with 10,000 mcg of Biotin. Since I had no idea what Biotin was ~ I wanted to know why does my body need Biotin. Here is what I found out at the University of Maryland Medical Center. Biotin is often called Vitamin H - part of the B complex group of vitamins. All B vitamins help the body to convert food (carbohydrates) into fuel (glucose), which is used to produce energy. These B vitamins, often referred to as B complex vitamins, also help the body metabolize fats and protein. B complex vitamins are needed for healthy skin, hair, eyes, and liver. They also help the nervous system function properly. Biotin is a water-soluble vitamin, meaning the body does not store it. Biotin is also important for normal embryonic growth, making it a critical nutrient during pregnancy. Biotin supplements may improve thin, splitting, or brittle toe and fingernails, as well as hair. Make sure to click HERE to read the complete article about Biotin - Vitamin H.
Is Biotin Burst making a difference? I have added Biotin Bursts to my daily vitamin routine. By taking a good multi-vitamin along with my other NeoCell vitamins I feel great and my hair and nails look better than they even have. I believe in NeoCell - I am a regular at GNC - my way of staying younger both mentally and physically. Promoting healthy collagen with the highest quality, most effective collagen and collagen related products on the market is our singular focus. NeoCell's cGMP facility in Southern California houses state of the art manufacturing equipment and an in-house, cutting-edge Research and Development Department. Through a proprietary enzymatic process, all of our collagen products are standardized for maximum absorption. We guarantee the dosage of every active ingredient provides the highest level of functional bioactive support, often exceeding our competitor’s dosage level by ten times. We are proud to apply pharmaceutical grade microbial, elemental and ionic purification processes to our collagen, which ensures unparalleled purity. NeoCell is a leader in quality vitamins. A name I trust to provide me with the highest quality vitamins and supplements for improved health. I love my biotin supplements! They do wonders for the hair and nails.